A tree uprooting in the middle of the night and landing on your home or vehicle can leave you scared, frustrated, and confused. As a homeowner, the best thing you can do in this situation is to call us. We have performed hundreds of emergency tree removals and understand your frustration and immediate needs in these situations. In the event of a tree emergency, we have knowledgeable Arborists available to help you 24/7. During a hectic storm, things can move very quickly. Because of this, we have storm emergency protocol that ensures safe practices during these stressful events and makes sure you receive the best service possible. Our first priority in these situations is your safety. 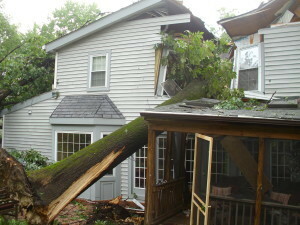 We get to work immediately to stabilize the tree to make sure it is safe for the homeowners and that no further damage will occur to the home. Once the tree is stabilized we work to remove it from the home safely, dispose of the tree, and clean up the debris. In the aftermath, we will also help you work with your insurance company. “We had a tree fall on our house (through one wall + substantial damage to the roof, including 6 large holes) on late afternoon July 3rd. I called RTEC because they had done a great job pruning our trees in the past. The receptionist tracked down a manager and he was at our house within 30 minutes of the call. He assessed the situation in a thunderstorm and arranged to have a crew out at first light. It was a very treacherous situation, our house is on a steep hill and it was a very large tree that pierced one wall and was dangling from the roof in front of several windows. To make it trickier the limbs were intertwined with the roof trusses. They worked non-stop for 6.5 hours on July 4th to surgically extract the tree without doing any further damage to the house or to the plants or HVAC units below. Fallen trees on houses, cars, and large structures. Wires in contact with tree branches. Partially attached limbs hung up in the high branches that could fall. Hollow or decayed areas on the trunk or main limbs. 3. Contact Your Local Fire Department. If a tree does fall on your house to make sure the property is safe to enter and that the fallen limbs have not knocked loose electrical wiring or natural gas piping which could create a hazard. 4. Never Touch Any Type Of Down Wires!